For a lot of people summer is coming to a close and school will be starting again soon (if you're in AZ it may have already began). I've even seen some fall items in stores. No. Just no... Pumpkin spice is literally the worst thing in the world when it's 110 out. Here in Arizona "summer" is at least 2 more months longer. So if you're still living it up in the heat (or even if you're not), here's a lovely little recipe for happy hour. Which in this case, is 2:00 in the afternoon because that's when Tucson is at it's absolute hottest. Yuck. 1) Mix all of the above ingredients in a pitcher. 2) Slice the peach and add it to the mix. 3) Place in fridge for 2-3 hours so the flavors can set. This time in the fridge is actually really important for good sangria. 4) DO NOT ADD ICE. Wait until you are ready to serve it. And kaboom. Done. Now yesterday I made this recipe again because we had some friends over for dinner. However, I found myself with only half a bottle of wine. Now that just wasn't going to do... So if you want "Citrus Peach Sangria with a Twist", just add a double shot of coconut rum. Because that is also super yummy and delicious and "mommy happy hour" approved. It's really hard to go wrong with this recipe. You can add/change basically anything. I think that's why I liked making it! I was able to experiment and stuff. Guess I missed my calling as a mad scientist. C'est la vie. I hope you get to make this deliciousness at least once before the magical/sweltering days of summer are over! Happy Cinco de Mayo! If you're scrambling to put something together for dinner tonight I have the answer. While I love me some authentic Mexican food (probably because I'm Mexican), it definitely can be really heavy and greasy. There is a time and place for that cheesy goodness. However, during the week, a heavy meal like that isn't always an option. So to satisfy my craving for the food of my people, I came up with a healthy alternative. I am not claiming that this is by any means a good substitute for the real deal. No sir. But I will say that this may help you when you're craving some goodness but don't want the calories. So pretty basic stuff. You can find Quinoa at your local health food store or even in the "healthy" section of your regular store. 1) Start out by cooking the ground turkey in a sauté pan. Add the fajita/taco seasoning while you are browning it. That way all the flavors actually cook into the meat. 2) While you're browning the meat, cook your quinoa. In a pot put one cup of quinoa and two cups of water or chicken broth. Bring to a boil, turn it down to low, cover, and cook for 12 minutes. Now this is just what I do, but you can follow the instructions your quinoa comes with. 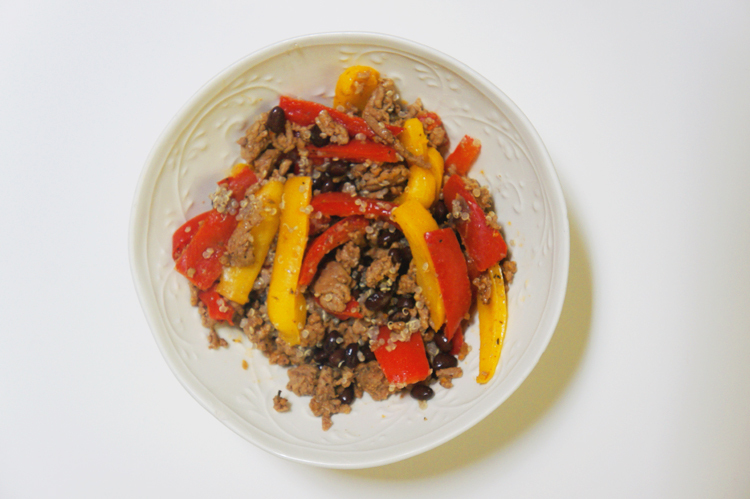 3) As your ground turkey browns, cut up your onion and bell peppers. I cut them like I would if I was making fajitas. 5) Add a can of black beans to your quinoa/veggie mix. Stir until mixed evenly. 6) Once the quinoa is done, you can begin to serve. 7) In a bowl scoop in the quinoa, then add the ground turkey, veggies, and beans. Then add sour cream and salsa (I use my homemade salsa!) to the top. Due to Andrew's heart health we have to really watch our beef in-take. Thankfully we are learning more alternatives (like ground turkey) and incorporating more heart healthy foods (like quinoa). If you're a mom you know that in certain situations, time is of the essence. For us, there is little time for a dinner that takes hours to make. I mainly stick to meals that are cooking all day in the slow-cooker or only take 20-30 minutes to put together. When you have toddlers hanging on your legs and a baby strapped to your chest, you don't have a lot of time to make something gourmet. Recently I whipped up a pasta meal in 20 minutes that everyone loved including the toddlers. And if you have a toddler you know what a big deal that it. 1) First, get the pot with water on the stove and wait for it to start boiling. 2) Get a sauté pan also on the stove and turn it to medium heat. Once it's warm enough, cook the pancetta. This will take around 5 minutes and the pancetta will become darker in color. 3) While the pancetta is cooking, cut up your asparagus into approximately one inch pieces or so. 4) Around this time the water should be boiling. Add your pasta and cook for the recommended time on the package. 5) While the pasta cooks, add the asparagus to the pancetta. When the asparagus is cooked (I like my asparagus with a little crunch so I don't sauté it for too long) add the stick of butter. Melt the butter down and then add the whipping cream. 6) After you've added the cream, add the two cups of parmesan cheese, stir everything together and then place the lid on the pan (still on medium heat at this time). 7) By this time the pasta should be done. Drain and return to the pasta to the pot. 8) Peek on your pancetta and asparagus. If the cheese has melted and the texture creamy then you're done. Turn off the heat and pour it over the past in the pot. Then stir it all up. Add some more parmesan when serving. Done! Dinner in 20 minutes! It's possible that it may take a little longer if you decided to only do one thing at a time. The 20 minutes are a result of multitasking. If that's not your cooking style then feel free to slow it down. This dish goes great with a glass of white wine too. Enjoy!